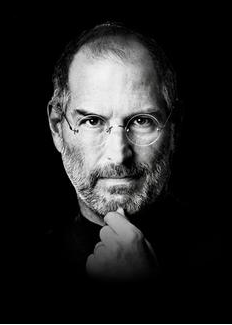 Paving the way to digital bliss, the wizard from Cupertino, is a man of many parts. Embodying the conquering vigor of pioneering America, and the innovative ecology of Silicon Valley, he followed his heart to create a Technological Universe that shone with his products and spun on its own orbit. And on the way, he ignited the world of soulless techies to listen to the beat of their own drummer and dared them to follow their own intuition and vision. Melding 20th century technology with the beauty of art and poetry, he repeatedly invented sleek new products – IPAD, IPHONES, ITunes, Power G-4 and many more that fascinated the world with its elegance and design. And he accomplished magic with a burning vision and an extraordinary intensity to bring giant resources into the hands of ordinary people. The world was never the same. Apples have fallen from the trees for centuries, yet it took one man, a scientist named Newton, who asked the question “Why” and the courage to follow his heart, that led to the discovery of a force called “Gravity.” In India, where Science comes with a sword of Damocles hanging over the students head in the form of scoring for entrance exams, the all important word, “Why” the fountainhead of discovery is hushed up by the intimidating and authoritarian stance of Principals, heads of Scientific institutions and institutional inertia. A new generation is growing up becoming compliant “yes men” without the audacity to be great innovators. “Yes men” will always be dependent men, dependent on others for defense equipment, for foreign policy, for education, for technology, and more. It is surprising that modern India is way behind Ancient India. At a time when the world did not know mathematics, India invented a revolutionary concept “the zero.” It was a stupendous concept, where you could add zeros (or nothing) next to a number to get large numbers. It was so colossal a change that it took Europe 15 centuries before it warmed to “zero.” Remarkable concepts of time and space spawned by the Rig Veda, is now being corroborated by quantum mechanics and “the theory of relativity.” The ancient sages who communed with the Universe had this tremendous thirst for knowledge, strength and wisdom and created perpetual trailblazers who changed the ancient world. In contrast, India today is struck in a silly paradigm, “Sonia is India, India is Sonia.” It is unable to get rid of the dirt and grime that is holding it down. Though physically free, the mind of India is still chained to the mesmerizing West, disregarding its own beating heart. Here the legacy of Steve Jobs is spot on. “Follow your heart and break the invisible fetters of your mind.” It is never too late to start.